We are in the midst of worldwide movement of transforming modern ways of chemical intensive farming that brought such problems as environmental pollution, health hazard, soil erosion, water pollution, endangering family farm, long distant transportation and monopoly of food system. In the FAO report on "International Conference on Organic Agriculture and Food Security" May 2007, it is remarked that organic agriculture is potentially an effective measure in solving problems that have emerged as a result of modern food production systems. Among the advantages raised are; preserving agricultural community, safe nutritious and locally available food, sustainable farming by its biodiversity, bring about quality water and soil, balanced nutrition from consuming them which leads to health. Towards the end of last year, Government of Japan enacted an Organic Agriculture Promotion Law which could become an epoch making step. Unfortunately, general perception of organic agriculture is a far cry with majority still harboring misunderstanding and its true value largely unrecognized. Organic produce in the market is estimated to be less than 1 % of total agricultural products. 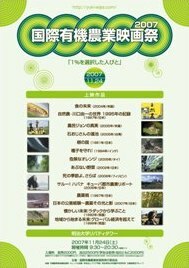 In order to raise awareness, we formed executive committee by people who have various interest in organic agriculture to screen quality films relating to organic agriculture from all over the world throughout Japan.